High Quality Reproduction Hoses with a perfect fit for easy installation. No Modifications Needed to our hoses. They meet or exceeds all "SAE" Standards (J188 & J189). Our hoses are individually tested for 100% Quality Control. They are made of the finest OEM materials and ALL Angles are correct and fits exactly like OE. "SAE J188 – high pressure power steering hoses, Each Hose is individually tested to maximum operating pressure of 1500 PSI. with burst pressure, more than 6000 PSI." 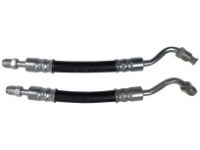 "SAEJ189 -Low Pressure Power Steering Hoses, Each Hose is individually tested to maximum operating pressure of 250 PSI. with burst pressure, more than 1000 PSI. Our hoses comply with SAE J189 specs"